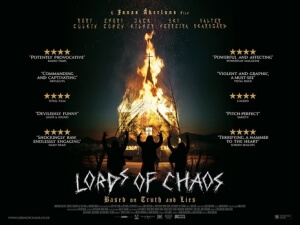 When Lords of Chaos opens, it declares that it’s based on “truth, lies, and what actually happened”, which immediately threw me off because until I saw that, I had assumed that this movie was a complete work of fiction. As it turns out, it’s very loosely based on real events about real people, in this case Norwegian death metal rocker Euronymous and his band Mayhem, and how their increasingly hostile and violent acts gained them notoriety and, eventually, a very tragic ending. Obviously, heavy death metal is not my particular music genre of choice, so forgive me if I fudge some of the details when it comes to describing the world that its admirers seem to live in, as well as their disturbing mind-sets that make you question why anyone would even like this sort of music, but to his credit director Jonas Åkerlund doesn’t shy away from its more sinister side and makes a film that’s often hard to watch, but at least interesting enough to prevent you from looking away. The film’s lead character, the eponymous Euronymous (played by Rory Culkin), guides us via voiceover narration through his career as the self-described inventor of Norwegian black metal via his band Mayhem, which delights in causing – what else? – mayhem during their live performances, especially with their Swedish lead singer Dead (Jack Kilmer) delighting in cutting his wrists on-stage and throwing the heads of pigs into the crowd. Things take a turn later on, though, when Euronymous befriends superfan Kristian, who later becomes known as Varg Vikernes (Emory Cohen), after he impresses our lead with his own music, signing him up at his black metal record label and integrating Varg as a member of the “Black Circle”, a group of death metal musicians that live by no rules and seek to tear apart the very fabric of society. This inspires them to take on more and more dangerous acts, including burning down churches and, eventually, deadly murders, all of which come back to seriously haunt them, but none more so than Euronymous himself. Almost right away, you feel uneasy about diving into this toxic and unsettling world that these characters live in; after all, it’s one that’s filled with horrible people who are constantly doing horrible things, all in the name of apparently rebelling against the system and against decency in general. These young metal rockers are unpleasant, rude, misogynistic, egotistical, and willing to do the most sociopathic things in order to obtain publicity for their obnoxious music, and the movie treads a thin line between glorifying this type of behaviour and also calling them out on it. It wants to have it both ways, showing these people enjoying themselves as they burn down churches, brutally stab people to death, and just in general be a massive bunch of dicks, but also have some of them contemplate whether or not they’re going too far; as a result, you’re not entirely clear on what the intent of the film is, because it feels both exploitative and reminiscent at the same time, when really it should have stuck to one or the other. Needless to say, there’s little to no likeability in these characters because, again, they are objectively terrible people that do increasingly evil and stupid things. I understand that the nature of heavy death metal is not even close to being all flowers and sunshine, but the way this movie depicts this certain culture it’s extremely obnoxious and kind of gross; it’s a world that seemingly delights in psychopathy, filled with people saying and doing horrible things to others, destroying public property, and committing cold-blooded murder, but somehow even worse than all of that is the unapologetic amounts of pretentious attitudes towards music that, when you break it down, isn’t even all that good. You don’t want to spend an entire movie with these people, yet we are trapped with them for just under two hours, forced to listen to them spout rebellious speeches so full of angst and disdain that they sound more like entitled teenagers more than “sophisticated” musicians, like if Holden Caulfield from The Catcher in the Rye decided to go all goth and create music that is largely unlistenable. The performances are good, with Rory Culkin and Emory Cohen doing strong work as the Jesse James and Robert Ford of this particular story (without giving too much away, unless you’re familiar with how both stories eventually end), but while I understand that the intent is to show how dark and disturbing this particular culture can be it doesn’t sit well enough with a more mainstream audience that can easily be put off by all this unpleasant activity. Despite its endless nastiness, I have to admit that I did find myself interested in this story and what directions it was eventually going to take; I had never even heard of Euronymous before this film, and seeing his story be played out in a fictionalised manner did leave me at least intrigued enough to learn a little bit more about this guy afterwards, if anything to see how accurately the film actually told his tale. Jonas Åkerlund doesn’t shy away from any of its disturbing content, which I respect even though the end results didn’t sit too well with me, and while there are times that the violence becomes pretty exploitative it is still admirable that a filmmaker can refuse to shy away from such a strong degree of bloodiness in this day and age, even though it comes when knife crime is becoming more and more of a serious epidemic. This is basically a lot of words just to say, this movie isn’t really for me. But I at least respect it for what it was trying to do. Lords of Chaos is a relentlessly unpleasant and disturbing movie about the toxic and reprehensible culture of heavy death metal, filled with hateful characters and exploitative violence, but is admirable only in the sense that it didn’t shy away from any of its nastiness in this day and age.